Get things done as fast as you can think. The mobile app that works the way you do. Whether you’re running a small business, a freelance professional, or managing employees from different locations, you need your tools to be as mobile as you are. Log in and track your time through any device, anywhere. It supports your own work flow. Task management, time-tracking, and weekly timesheets. For professionals who like to plan their activities at the beginning of the day - Use the Day Planner to allocate your time in advance to the day's tasks. For professionals who need to track their work in detail - Launch the timer from your desktop in a single click. Just choose your task and switch it on. For professionals who bill per hour or day - Just focus on your work and record your activities at the end of your day. When you need to log dozens of activities per day, every second counts. Odoo Timesheet is as fast as you are. Odoo Timesheet stays up and running even if there is no internet connection. Just launch your timesheet as usual and the data will sync your account once you’re back online. It’s that simple. 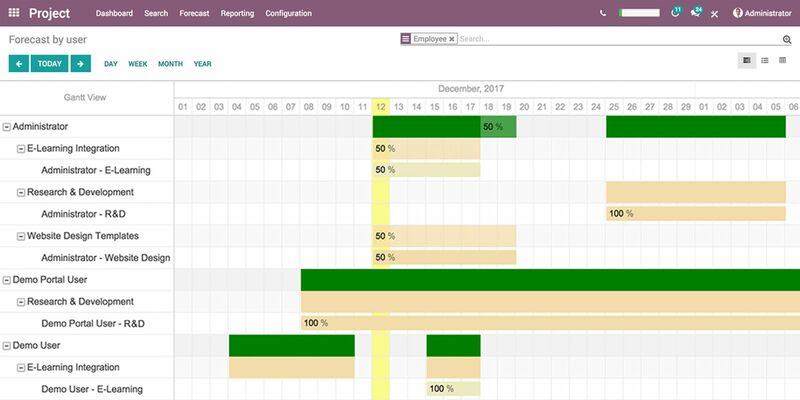 Keep your projects under control and manage employee time from the Odoo backend. Visualize your team's progress on each project or task. Tracking expected hours, effective hours and reforecasts on tasks has never been so easy. Get an overview of your billable time. Track all the resources allocated to your project and see your profits and losses. Automatically generate one-time or recurring invoices based on expenses and timesheet entries. Schedule your teams across projects taking employees' holidays into account. Plan ahead for upcoming projects with forecasts based on comparable projects and estimate deadlines more accurately. Compare forecasts with real timesheets for increased profitability. Connect timesheets with payroll for accurate and on time payments. Check and manage employees attendance and worked hours. Automate invoicing and billing based on timesheet inputs. Keep track of the time spent by project, client or tasks.